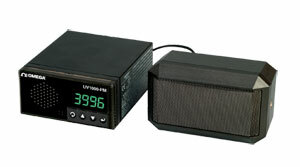 The UV1000-PM series has been discontinued. You can contact our Sales Department to inquire about any remaining stock. The new OMEGASEZ® UV1000-PM universal verbalizer is an innovative panel meter that can verbalize and display process signals 0 to 10 Vdc, 0 to 20 mA or 4 to 20 mA, and Type J, K, T, and R thermocouple signals. You can configure/program the verbalizer through the friendly PC user interface software to specify the input range, display decimal point, analog input scaling, audible engineering unit, and high/low alarm set point. Select from over 100 engineering units while configuring the verbalizer. The front buttons allows the user to select different inputs, command/continuous talk, and adjust volume. The UV1000-PM is a creative solution for process monitoring almost any type of measurement with speech/ display/alarming. 참고: Comes complete with operator’s manual, external speaker, and CD with configuration program.